This is a drill we do at the beginning of practice to get our players comfortable playing in our D zone coverage. We have coaches in either corner of the D zone. 3 Forwards and 2 D line up in their D Zone positioning on the coach who has the puck. The puck will move from coach to coach and the players have to adjust accordingly in their coverage (simulates a puck changing sides in the D Zone). Coaches can exchange the puck as much as they want (usually only once or twice), then they release the puck (down low, up the wall, on the rim, whatever). 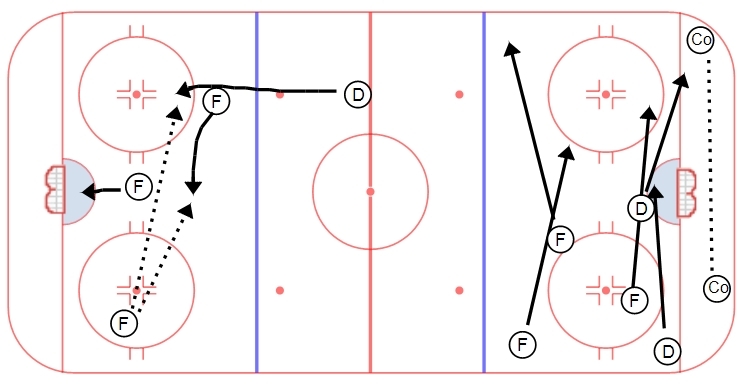 On the release, the players pick up the puck and go on a 5v0 rush through the NZ and attack the far net. Look to get a good net drive and width on the attack with good D activation. Simulation of D Zone positioning and getting players comfortable playing in the rights spots is a critical part of defense in hockey. This drill allows our players to get a feel for their surroundings and where they should play positionally.